[ #FacewareLive #SIGGRAPH ]Los Angeles, Calif. - Aug 06, 2014 - Faceware Technologies, the leading provider of markerless 3D facial motion capture solutions, today announced that it has upgraded and released version 2.0 of its real-time facial mocap and animation product, Faceware Live. Originally announced at Siggraph 2013, the first version of Faceware Live has been in testing at a handful of studios since last Fall. Demos of the upgraded solution will be available in Faceware Technologies? booth #653 at Siggraph 2014, Aug 12-14. Faceware Live produces facial animation in real time by automatically tracking a performer?s face and instantly applying that performance to a facial model. Faceware Live can use either an onboard computer video or webcam, the Faceware Pro HD Headcam System, or any other video capture device, to drive the real-time performance. Under the hood is patented computer vision technology, called Live Driver, from our partner company Image Metrics?, which is capable of real-time facial tracking in nearly any lighting condition with any performer. Instant Calibration - With Faceware Live 2.0, calibration of any new performer takes only 1-3 seconds. There is no need for a lengthy range of motions or a complex character setup process. Performers will make a single “neutral” expression and with one button click, they are “found” by the tracking technology and their performance can be captured. Improved Facial Tracking - Faceware Live captures nearly 180 degrees of motion, allowing the live talent to be freer in their performances. In addition, Faceware Live tracks 22 more facial points than version 1.0, significantly increasing the quality of the facial motion capture. Consistent Calibration - One area of real-time motion capture often overlooked is consistency in calibration from day-to-day with the same actors. Faceware Live features an entire interface to aid in this process by allowing the user to store and recall calibration frames as an overlay to the live feed, as well as the ability to toggle a grid for consistent camera and framing. Faceware Live also allows multiple actors to be calibrated at once by using Live?s multi-sync calibration feature. Support for High-Frame-Rate Cameras - Studios looking to achieve ultimate quality and responsiveness will be eager to use Faceware Live 2.0?s unique ability to accept data from high-frame-rate cameras. The quality of facial motion extracted at higher frame rates allows for more believable performances in real time, which is critical for capturing areas of subtle movement and detail such as the lips and eyes. Stream Multiple Characters - With version 2.0 of Faceware Live, there is no limitation to the amount of characters that Faceware Live can track at once. For example, studios can have multiple characters interacting with each other in front of a live studio audience, or in complex pre-viz sequences and game scenes. Unity Game Engine Support - In addition to Autodesk MotionBuilder®, Faceware Live 2.0 now works in tandem with Unity, one of the most popular game engines on the market. Real-time facial animation can be displayed in the Unity editor as well as live in the game itself. Future game engine support is planned. 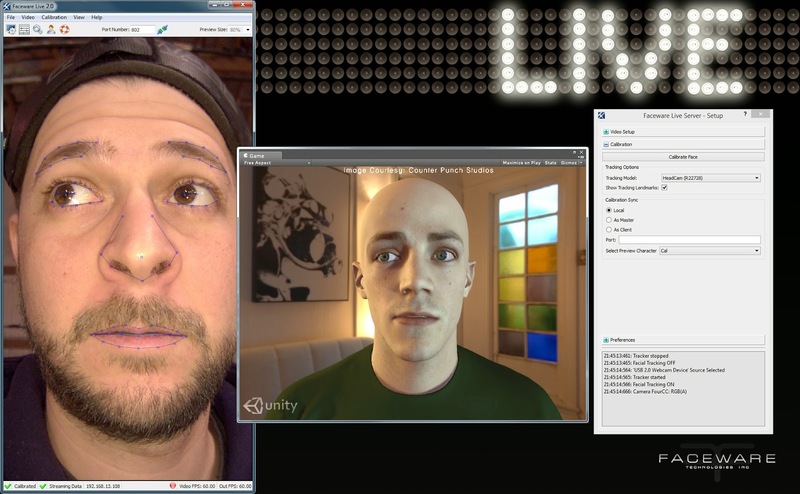 Faceware Live 2.0 streams facial data over TCP, allowing studios to custom integrate Faceware Live 2.0 into nearly any rendering environment. Faceware Live is primarily designed for live broadcast events, instant content creation, facial research and study, and pre-visualization. However, the possibilities are endless. Nestle recently used the technology to power a live marketing display for the Snickers brand in Korea. For pricing and sales information, contact sales@facewaretech.com. For general product information, please visit the Faceware Live page.